We describe a technique of microinjecting the aminoglycoside, gentamicin, into 2 days post-fetilization (dpf) zebrafish larvae to induce acute kidney injury (AKI). 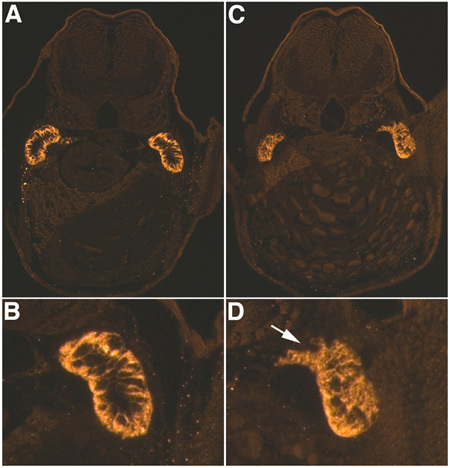 We also describe a method for whole mount immunohistochemistry, plastic embedding and sectioning of zebrafish larvae to visualize the AKI mediated damage. Cianciolo Cosentino, C., Roman, B. L., Drummond, I. A., Hukriede, N. A. Intravenous Microinjections of Zebrafish Larvae to Study Acute Kidney Injury. J. Vis. Exp. (42), e2079, doi:10.3791/2079 (2010). In this video article we describe a zebrafish model of AKI using gentamicin as the nephrotoxicant. 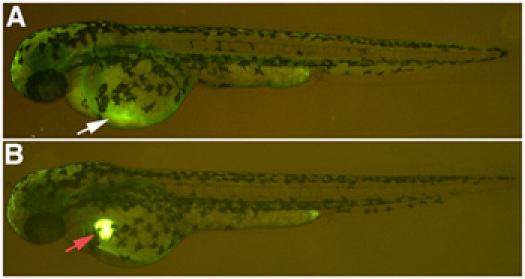 The technique consists of intravenous microinjections on 2 dpf zebrafish. This technique represents an efficient and rapid method to deliver soluble substances into the bloodstream of zebrafish larvae, allowing for the injection of 15-20 fish per hour. In addition to AKI studies, this microinjection technique can also be used for other types of experimental studies such as angiography. We provide a detailed protocol of the technique from equipment required to visual measures of decreased kidney function. In addition, we also demonstrate the process of fixation, whole mount immunohistochemistry with a kidney tubule marker, plastic embedding and sectioning of the larval zebrafish. We demonstrate that zebrafish larvae injected with gentamicin show morphological features consistent with AKI: edema, loss of cell polarity in proximal tubular epithelial cells, and morphological disruption of the tubule. Part of the following protocol is based on published methods reported by (Hentschel et al. 2005) and (Weinstein et al. 1995) with slight modifications. The fish are injected at 2 days post-fertilization (dpf). Therefore, adult zebrafish are bred 3 nights prior to a planned experiment. Collect embryos and place them in a Petri dish with E3 water (5mM NaCl, 0.17mM KCL, 0.33mM CaCl2, 0.33mM MgSO4 ) at 28.5°C. At the end of the first day remove dead embryos from the Petri dish and separate embryos so that there are 80-100 embryos per Petri dish. Prepare the glass needles pulling from capillary tubes (4 inches in length, 0.63/ 0.20 OD/ID millimeter (mm) R-6 Custom Glass Tubing Drummond scientific company, Broomall, PA 9-000-3000) with an electrode puller. The tip diameter should be of 10-20 μm. Under a dissecting microscope (Leica S6E), with a permanent marker draw approximately 10 1mm lines along the needle, with the help of a ruler, and store the needles in a large Petri dish on clay ramps. Prepare the holding pipette: Fire-polish the tip of a thin walled borosilicate glass capillary tube (152 mm, 1 / 0.75 OD/ID mm TW100-6, World Precision Instruments, Inc.) in a Bunsen burner flame until the inner diameter of the tip is 0.4-0.5 mm. Such dimension allows for good grip of the yolk sac of a 2 dpf zebrafish larvae. Hold one end of a piece of glass capillary using long forceps, and heat the opposite tip with of the capillary with the Bunsen burner, placing it vertically over the light blue inner cone of the flame, the hottest part, for 1-2 seconds, rolling it to obtain an even melt. Repeat this a few times then examine the capillary under the microscope, on a stage micrometer (Ward's 94 W 9910). This is a critical step, it might be necessary to fire-polish a few holding pipettes and select the appropriate size later, while you are manipulating the larvae. If you are careful, one holding pipette lasts for multiple microinjection sessions. Fill the Manual Microsyringe Pump (MMP, World Precision Instruments, Inc.,) with mineral oil, following the instructions given by the manufacturer. The pipette holder is inserted in a joystick manipulator (Narishige, MN-151), connected with a magnetic stand (Narishige, MN 151) to an iron plate (Narishige, IP). Prepare 20μl of the injection mixture: 2.4μl gentamicin (Sigma-Aldrich G8648, 50mg/ml in saline solution) and 17.6μl 10-kDa lucifer yellow dextran (Invitrogen D1825, (1mg/ml in saline solution). In the control fish the gentamicin is replaced with saline solution. The fluorescent dextran (many different colors can be used) is sufficient to verify the accuracy of the injection and select larvae that have been injected with the nephrotoxicant. Prepare 2 30mm Petri dishes with 2ml mineral oil for placing the injection mixture and control mixture under, to prevent evaporation of the solutions. Prepare the anesthetic: 400 mg tricaine powder (ethyl-m-aminobenzoate methanesulfonate SIGMA A-5040) 97.7 ml DD water, 2.1 ml 1M Tris (pH 9). Adjust to pH 7. Store this stock solution in the freezer, in aliquots of 4.2 ml. To use tricaine as an anesthetic dilute the 4.2 ml tricaine stock solution in 100 ml E3 water (Westerfield 1993) and leave at room temperature. Manually remove any chorions remaining with fine forceps and anesthetize the zebrafish transferring them in a Petri dish with tricaine warmed at room temperature. Zebrafish should be exposed to tricaine at least 15 minutes before starting the microinjections. Open the tip of the injection needle using a razor blade (VWR scientific 55411-050). Hold the blade at a slight angle to create a bevel and cut the tip such as to obtain a tip opening of about 10-20μm diameter. Turn on power, vacuum and air supply of the microinjection apparatus (World precision instruments Inc., PV820 pneumatic picopump). Insert the needle into the needle holder mounted on the micromanipulator and tilting base (Word Precision Instruments, Inc., Model M3301R, TB-1). To fill the needle, place a droplet (10μl) of the solution to be injected in the 30mm Petri dish filled with mineral oil (Fisher Chemicals, 0121-1). Turn the manual micromanipulator so as to submerge the tip of the needle in the drop of solution, set the picopump "hold/vent" switch to "vent" ("vent" equates to vacuum on the PV820), and fill the needle by pulling solution in through the needle tip. This will take a few minutes, if the solution gets into the needle too fast, that means that the diameter of the tip is too big, and the injections won't be accurate. After the needle is filled, set the picopump to "hold" ("hold" equates to inject on the PV820). To calibrate the needle, set the picopump "gated/timed" switch to "gated", press the foot pedal to discharge the needle, and record the time it takes (seconds) for the meniscus to travel from one marking to the next (1 mm total distance). Repeat 3 times, take the average time (in seconds), and divide the value by 30 (volume in nanoliters (nl) corresponding to 1 mm linear distance) to determine the number of milliseconds required to deliver 1 nl of solution. Adjust the range period knob to this number, and move the "gated/timed" switch to 'timed'. Now the picopump is set to deliver a 1nl pulse of solution. Remove the mineral oil dish and position the Petri dish with the larvae under the microscope. Group the fish in the centre of the Petri dish and focus. Place the holding pipette in the manual microsyringe pump (MMP, World precision instruments) on the opposite side of the microinjector, advance its tip to the Petri dish, and into the plane of focus of the microscope. Bend it with a fairly shallow angle, so that the very tip of the holding pipette is touching the bottom of the Petri dish and is close to horizontal. Make sure not to have any air bubble in the system, which would slow the response time and decrease the precision of the MMP. Change to a higher magnification on the microscope and use a superfine eyelash with handle (Ted Pella 113) to position the larval fish dorsal side down with the yolk very close to the holding pipette. Hold the larval fish by sucking the yolk into the holding pipette by turning counterclockwise the micrometer drive controlling the manual microsyringe pump. Take care not to turn the micrometer too far, as the yolk can burst if pulled too deep into the holding pipette. Focus on the forming common cardinal vein, which lies over the yolk, just beneath the periderm and is the site of very high blood flow. With the micromanipulator of the injection apparatus, guide the needle into the developing common cardinal vein. It is typically necessary to pull the needle back a bit after insertion, as the common cardinal vein is very superficial. Inject 1nl of solution by pressing the foot pedal, then release the larvae from the holding pipette and return it to embryo water. This is a critical step, especially the first time, because it requires a certain amount of practice in positioning the fish and controlling the suction and pressure of the rig. If the yolk of the embryo is properly held with the holding pipette, it won't roll as the needle enters. To verify the success of the microinjection, monitor the presence of the lucifer yellow dextran in the heart of the zebrafish under a fluorescent microscope. The lucifer yellow remains visible in the heart for approximately 20 minutes before dissipating into the circulatory system If the nephrotoxic solution is injected correctly, within 2 hours of the injection you will see very little lucifer yellow dextran remaining at the site of injection. If the solution is injected in the yolk sac, a spot of lucifer yellow dextran will remain at the site of injection. (Fig. 1). Return the fish to E3 medium. Two days post-injection, the larvae develop pericardial edema as a consequence of decreased kidney function (Fig. 2). At 4 dpf, put between 10 and 15 larval zebrafish in 4ml glass vials (Weathon, 225012) and fix them in 1ml Dent's (80% MeOH 20% DMSO) for 4 hours at RT. Rehydrate the embryos in a graded MeOH/PBT (PBS with 0.5% Tween20) series, 75:25 50:50, 25:75, 100% PBT, pipetting the solution out and adding new solution to the same vial (1ml of solution per vial), 20 minutes in each solution. Larvae should never be exposed to air, leave a little solution covering the larvae when changing solutions. Remove PBT and replace 1ml with blocking solution (PBS with 1% DMSO, 0.5% Tween20, 10% normal goat serum) for 3 hours at 4 °C on a nutator. Remove the primary antibody and wash 3 x 30 minutes with incubation solution at RT. Incubate with secondary antibody (goat anti-mouse cy3, Jackson Immunoresearch Laboratories, Inc. 155-165-003) diluted 1:500 in incubation solution for 2 hours at RT. Wash 3 x 30 minutes with PBT. Dehydrate tissues through a graded ethanol series (50%; 75%; 95%; 100% x 2), 10 minutes per step. Prepare the infiltration solution: 25 ml of JB-4 Embedding Solution A (Polysciences 0226A) and 0.24g of catalyst (Polysciences 02618). It takes a while for the catalyst to dissolve, about 20-30 minutes. The solution can be stored at 4°C up to 1 month. Decant off the 100% ethanol and replace with plastic infiltration solution. Place the vials a 4°C on a rotator and allow infiltration to proceed until the larvae sink to the bottom of the glass vial. This process usually takes about 30 minutes. Embedding protocol: Place the plastic molding cup tray (Polysciences, Inc. 16643A) under a dissecting microscope. Transfer the larvae, along with infiltration solution to cover, into the cups. The plastic embedding media is prepared in a small plastic tube. We normally embed 4-5 fish at a time, one fish for each cup. Prepare 5-6 ml of embedding plastic (1.2 ml of embedding solution for each cup) adding 35 μl of JB-4 Embedding Solution "B" (Polysciences Inc. 0226B) for each ml of infiltration solution. Add 35 μl of JB-4 Embedding Solution "B" (Polysciences Inc. 0226B) for each ml of infiltration solution. Mix well, pipetting up and down with a plastic Pasteur pipette several times. This is important because if not mixed well the JB-4 won't polymerize properly. After 5ml of embedding plastic has been prepared, remove infiltration plastic from around samples with a Pasteur pipette. Fill the cup with embedding plastic. The plastic must ooze out of the cup, to ensure good attachment of the block holder to the specimen. To detect zebrafish renal tubules, transverse sections are the best. For this purpose, the fish are embedded vertically, head down. With the aid of an eyelash with handle or fine forceps, periodically position the fish vertically, until the plastic is hard enough that they don't move from their position. It takes about 20-30 minutes. Then, place the EBH-2 Block Holder (Polysciences Inc. 15899) over the cups and leave the tray at 4°C overnight. When polymerization in complete, you can pop out the blocks like ice cubes. Alternative embedding protocol for multiple larvae: Fill molds halfway with complete JB-4 and allow it to polymerize. For the 15 mm square molds we use the JB-4 volume at 700μl to fill the mold halfway. Next, add the JB-4 soaked larvae with hardener to the pre-polymerized half-filled molds. Orient the larvae with the head pointing toward the long side of the mold and align the larvae so the eyeballs line up (you can put 10 fish in a single mold in a line). After the block is polymerized you can cut the block edges, turn it so the side is facing the knife and superglue it to a plastic "chuck" that fits in the microtome. With this method you can position a large number of larvae in the same block, centered in the plastic, and ready for cross sections. Care has to be taken orienting the block to the knife so that equivalent sections of each fish are taken in a single section. This can be accomplished while sectioning through the eyes: i.e. orient the block so that equivalent sections of the eyes are taken for each fish. The end result is that you can analyze many fish concomitantly on a single microscope slide. Set the slide warmer to 45°C. Before sectioning, be sure the block is oriented such as to obtain perfect transverse sections of the fish. The orientation head adjustment levers can be rotated enabling to position the specimen head accurately to the knife. Start cutting thick sections through the head of the fish. While sectioning through the eyes, orient the block so that equivalent sections of the eyes are taken for each fish. When the pectoral fins appear in the sections, that is when the pronephric tubules start. From this point, cut about 32 4 um sections from the block. Collect the sections with forceps and let them drop into the beaker with water, without touching the water with the forceps. The section will expand as soon as it hits the surface of the water, now you can collect it on a slide. Insert the slide into the water at a 45° angle and approach the section with the help of an eyelash with handle, touching only the borders of the section. Incubate the slides on a slide warmer until completely dry. Image sections using epifluorescent or confocal microscopy. When performed correctly, injected fish appear like in figure 1, with little fluorescent dextran (in this case Lucifer Yellow) visible in the heart and in the circulatory system. If the injection is too deep, injected material can be seen concentrated in the yolk sac, or the heart can be punctured causing excessive bleeding. If the holding pipette is made correctly, the fish won't roll or move when injected, and this will allow a more accurate injection. Also, it's important to make sure not to have any air bubbles in the MMP, which would slow the response time and decrease the precision of the system. Generally, as a consequence of gentamicin nephrotoxicity, 80% of the injected fish develop pericardial edema (Fig. 2). We use a phenotype based classification system, in which fish with moderate edema show evident pericardial edema but no others observable phenotypes, whereas severely edematous fish show pericardial and trunk edema, with slight to moderate axis curvature. Using a renal tubule antibody against Na+/K+ ATPase (α-6F) we can visualize the damaged tubules in transverse sections, with an evident loss of cell polarity and tubular disruption in damaged tubules as compared to controls (Fig. 3). This pattern is consistent through multiple transverse sections. In order to obtain perfect transverse sections of the renal tubules is important to position the fish correctly during the embedding. When comparing sections, pectoral fins and proximal convoluted tubules are used as anatomical markers. Figure 1. Nephrotoxin microinjection. (A) Successful injection of a 10kDa dextran conjugated to lucifer yellow, with faint expression in the common cardinal vein, white arrow. (B) Incorrect injection, resulting in a deposit of 10kDa dextran conjugated to lucifer yellow that does not dissipate into the circulatory system, red arrow. Figure 2. Gentamicin-mediated edema. (A) Control injected larval zebrafish. 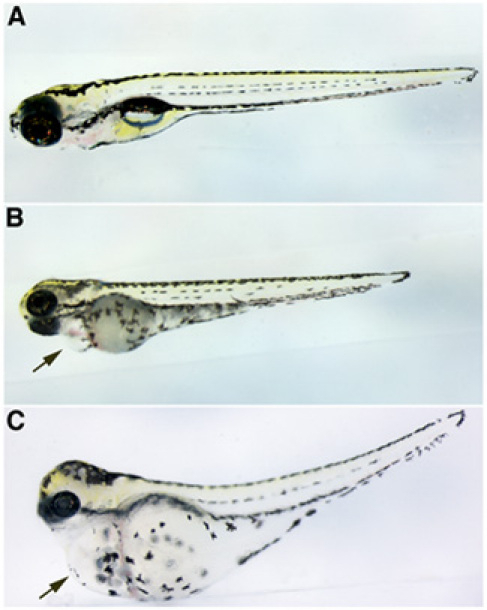 Gentamicin injected larval zebrafish with (B) moderate or (C) severe edema. All larvae are at 4 dpf with anterior to the left and dorsal is up. Black arrows point to pericardial edema in B and C.
Figure 3. AKI immunohistochemistry. α-6F antibody staining for Na+/K+ ATPase 48 hours-post gentamicin injection (4 dpf larvae) in control (A,B) and gentamicin injected (C,D) larvae. A, C are at 20X magnification and of B and D are 3X digital magnifications of the right tubules in A and C. Note loss of basolateral polarity and tubule disruption, white arrow, in D as compared to B. In this video article we demonstrated an intravenous microinjection technique for an AKI model, by creating gentamicin mediated proximal tubular damage in zebrafish larvae. This damage results in the formation of pericardial and/or gross edema, reflecting an inability to regulate water balance. We also described an immunohistochemistry experiment with an antibody that marks differentiated kidney tubules (Majumdar et al. 2000), showing loss of cell polarity and a disruption of the proximal tubule in damaged kidneys. Intravenous microinjections represent an efficient method for delivering a soluble substance into the bloodstream of zebrafish larvae. This technique is an excellent tool for the introduction of a variety of substances and with the aid of a fluorescent marker uniform injections can be repeated many times over allowing for consistent results. This work was funded by the US National Institutes of Health (NIH) grants R01DK069403 and P30DK079307. Manual microsyringe pump World Precision Instruments, Inc.
Hentschel, D. M., Park, K. M. Acute renal failure in zebrafish: a novel system to study a complex disease. Am J Physiol Renal Physiol. 288, (5), F923-F929 (2005). Majumdar, A., Lun, K. Zebrafish no isthmus reveals a role for pax2.1 in tubule differentiation and patterning events in the pronephric primordia. Development. 127, (10), 2089-2098 (2000). Weinstein, B. M., Stemple, D. L. Gridlock, a localized heritable vascular patterning defect in the zebrafish. Nat Med. 1, (11), 1143-1147 (1995). Westerfield, M. The Zebrafish Book. University Oregon Press. Oregon. (1993). We use standard glass knives and a Leica RM²165 microtome for cutting JB-4 plastic blocks. To make the knives you need a glass knife maker, a Leica EM KMR3 or equivalent knife maker. These are the same type of knife used in EM facilities to make thick sections from Epon embedded samples. The knife maker can be $6-10K so if you want to go this route it might be easiest to buy some glass bars and arrange to use a knife maker in a core EM facility. EM supply companies sell useful plastic boxes for storing 10-15 knives after you make them.